Black Bean Quinoa Chili – packed with protein and healthy veggies, this vegetarian chili is hearty and satisfying! I know everyone is knee deep in Thanksgiving menu planning. If you still need more recipe ideas, check out all of my offerings HERE. But, in the meantime, we gotta get through the rest of the week first. That’s where this Black Bean Quinoa Chili comes in. It’s quick and easy, packed with protein and nutrition to get through your days, and it even tastes just as great leftover. So make yourself a big batch to eat throughout the week so you can better focus on the upcoming holiday. 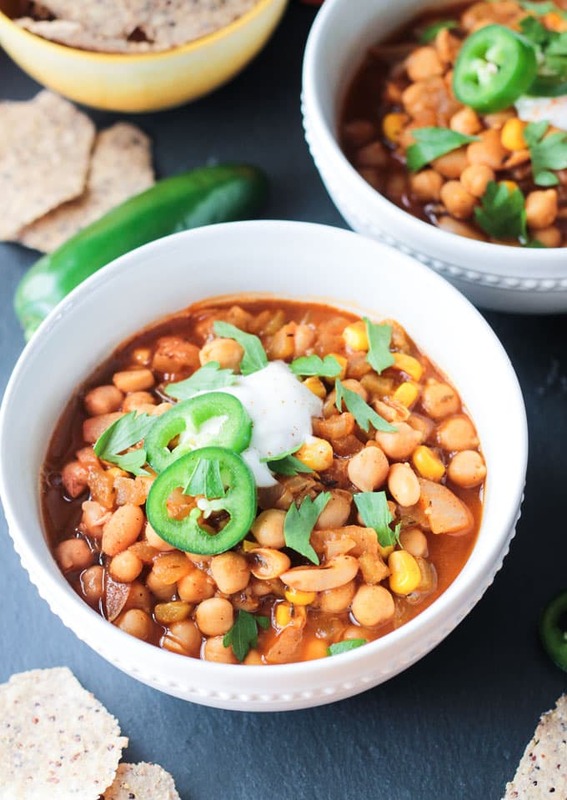 In case you’re not convinced yet that chili doesn’t need meat to be hearty, savory and delicious, maybe you haven’t seen my Slow Cooker Black Bean Butternut Squash Chili, Easy Cheesy Chili Mac, or Pumpkin Lentil Chili. And if that’s not enough, I have even more on the blog, and I’m adding another one right now – this Black Bean Quinoa Chili. Every time I create a new chili, I always think I’ve made a new favorite. That is, until I create a new one. I guess I just love chili so much that every single one is my favorite! And I think you’ll love this one too! I mean, really, is chocolate ever a bad idea? I think not. Now, before you start wondering if this black bean chili actually tastes like chocolate, let me assure you, it does not. The unsweetened cocoa powder (do not use milk chocolate or any other sweet chocolate) lends a great depth of flavor and a slight bitterness that complements the sweet peppers and corn and tones down the acidity of the tomatoes. No one will know it’s in there unless you tell them, but they will definitely know they like it! I hope you love this vegan quinoa chili as much as we do. If you make it, please come back and leave me a comment below with your feedback and star rating. You can also find me on social media. Snap a quick pic and tag @veggie_inspired and #veggieinspired so I’m sure to see it. Enjoy! Ooh, I love chocolate with chili like this. So good! Thanks, Sarah! I might be putting chocolate in all of my chili from now on! Chili is one of my favourite meals ever and there are so many ways you can make it so it never gets old. I always add cocoa or chocolate to mine too. It makes such a difference! It does make a big difference! I love my chili hearty – like you could stand a spoon up in it kind of thick. 🙂 Thanks, Mel! I’m loving everything about this chili! It’s a perfect dinner to cozy up with any night of the week! So warm and hearty! Just what you want from a bowl of chili! It’s been raining here all day. It’s definitely cozy dinner night! Thanks, Taylor! The color in this is just so pretty! I love the addition of so many superfoods, quinoa is the best! Thank you, Emily! I love the quinoa in it too – helps give it that ground meat kind of texture. Mole chili! Love all of the deep flavors in this version – it sounds so fulfilling and rich. 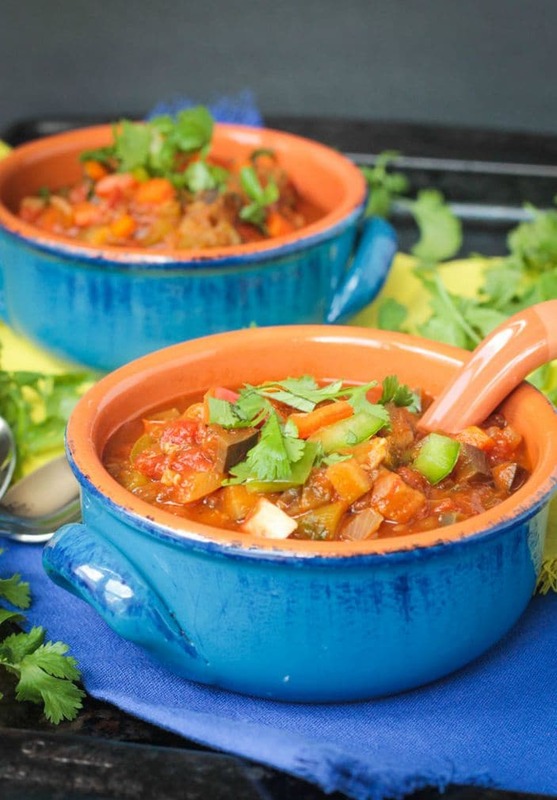 This chili looks so hearty, warm & comforting! Perfect for those breezy days ahead. I love adding chocolate to my chili, too. It adds such a nice flavor. This chili looks amazing, Jenn! Actually, ALL your chili recipes look amazing! I love chili! HaHa! I have a slight chili (and soup) obsession!! Thank you! I have never tried making a savory dish with cocoa power! I must do it though! Just make sure to use the unsweetened kind! 🙂 Thanks, Laura! This is so perfect for cold winter days! Definitely! And now it’s raining here too – even worse! Cocoa powder in chili is an interesting concept. I’ll have to give it try! I also like the quinoa for added protein! By the way your photos awesome! Thank you so much, Sonali! You should for sure give it a try! Fabulous! The little bit of coca in there must really make this chili special. Sounds wonderful. Yes, it adds a little something extra. So good. Thanks, Ginny! I’ve never added cocoa to my chili, what a fun twist! I love the quinoa in here too! Thanks, Elizabeth! I think you would love it! And the quinoa helps give it that texture of ground meat. Yes! Or if you have guests arriving a few days early – a big pot of chili would be a nice warm welcome. And it freezes beautifully in case there are any leftovers that won’t get used up in time. Thanks, Mary Ellen! This looks like such a lovely, hearty supper! Can I skip the Thanksgiving turkey and make this instead? So tempted to. Here it is the Tuesday before Thanksgiving and our house go hit with the crud. A veggie chili would hit the spot. I love the cocoa part … the more complex flavors the better. Ugh, I feel for you. We get sick every year at Thanksgiving. It’s and unfortunate tradition. One year, we flew to see my parents in NV and one of my daughters threw up about 12 hours before we were to leave. The other daughter and my hubby both got it ON Thanksgiving Day and then I got it 2 days after we got back home. The only one saved was my son, who I’m guessing was the one to bring it into the house in the first place. We’ve had colds this year for the past 3 weeks – they just keep passing it amongst themselves. Thankful, it’s not anything worse this year. I hope you guys feel better soon!!! And, yes, chili in lieu of turkey is totally acceptable! are you a mind reader?! My husband just said to me, hey have you heard about cocoa in chili? Can we try that…and I was like well I’m not sure, I can look it up. TADA!!! I haven’t tried chocolate in chili, but I’ve heard it’s amazing. I MUST try this. Perfect for football Sundays! Definitely great game day eats!! And the chocolate was amazing! Definitely not chocolatey, but adds a little something that is just so good! Thanks, Chrissa!